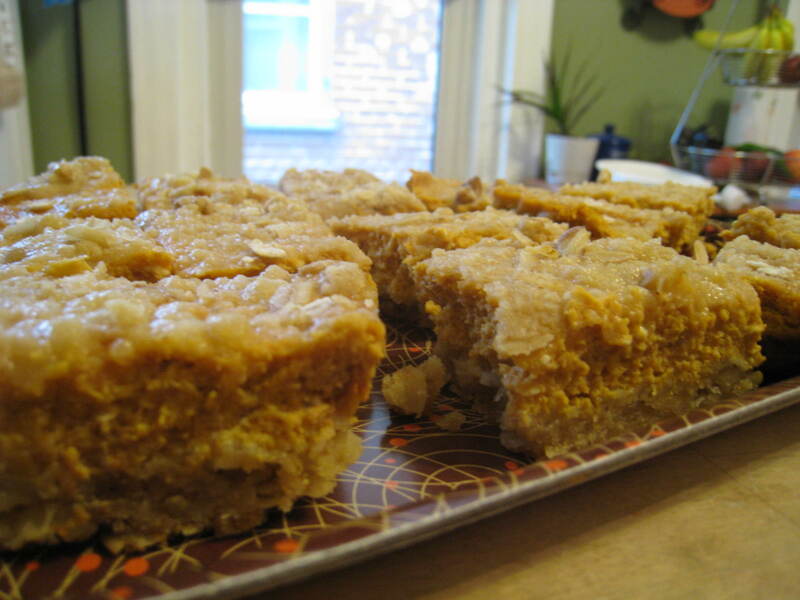 I had some leftover pumpkin and this recipe has been in my “to try” pile for years and I finally got around it. Preheat oven to 350 degrees. Line 13×9 inch baking pan with foil, making handles on the end. Grease foil lining. Mix flour, brown sugar, and 1/4 cup of white sugar in medium bowl, cut in butter with a pastry blender until mixture resembles coarse crumbs. Stir in oats and nuts. Reserve 1 cup of the oat mixture, press remaining mixture into the bottom of the pan. Bake for 15 minutes. While the crust is baking, beat cream cheese, remaining 1/2 cup sugar, eggs, pumpkin and spices in a small bowl with a mixer on medium speed until well blended. Pour over cooked crust and sprinkle the pumpkin mixture with reserved crum mixture. Bake for 25 minutes. Lift from pan using foil handles and cool completely. Cut into 25 bars.